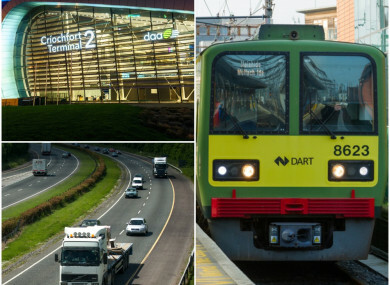 EXPANDED DART SERVICES, a second airport runway and a firm commitment to the M20 motorway. These are just some of the projects the government discussed today at the special Cabinet meeting on the National Development Capital Plan and the National Planning Framework (NPF). The NPF, which is due to be published in the coming weeks, is basically the government’s long-term plan for what Ireland should be like in about twenty years time. It seeks to answer questions like: Where will we live? Where will we work? And how will we get around? The investment and infrastructure priorities in the development plan for the next ten years are closely aligned with the objectives of the new NPF. A lot of the items mentioned in the plan have been mooted for some time now, or are already contained in the programme for government. According to government sources, the plan contains “a firm commitment to the M20 from Limerick to Cork“. This 80 kilometre stretch of road will be a new direct route between Cork and Limerick, and linking in with Galway also. The Taoiseach said previously the new motorway will link the three big cities which he said is important for balanced regional development. The framework also signs off on a second runway for Dublin Airport. DAA has been pushing for a new €320 million runway which it says is necessary to develop the airport into an international travel hub. Speaking in the Dáil last week, the Taoiseach said the Cabinet agreed to support the plan, adding that he hopes work can start within months. While Dublin Airport will get a boost in investment, so will other air links around the country with the ‘Regional Airports Programme‘, which is also highlighted in the plan. The working document for regional airports that runs to 2019, states that regional airports are viewed as being important because of a level of international connectivity that they bring to a region for tourism and business. The government views this connectivity as a significant contributory factor underpinning Ireland’s economic recovery and sustainable development into the future. The plan also commits to the DART Expansion Programme which will focus on additional fleet and extending the electrified Dart system on both the Northern rail line to Balbriggan and the Maynooth line. There will also be further investment in the primary and post-primary school building programme, investment following the hospital bed capacity review, with key project delivery commitments on the National Children’s Hospital and the National Maternity Hospital. Government sources state there will be investment in the technological universities, in Ireland’s cultural and heritage sites, as well as the Garda ICT systems (something that has been flagged previously by the former Minister for Justice Frances Fitzgerald). The plan is also intended to achieve a step-change in Ireland’s response to climate action goals. All in all, the capital plan up to 2027 requires total public Investment (from the Exchequer & State Owned Enterprise) of around €115 billion. The total Exchequer investment is estimated at €90 billion, with an additional non-Exchequer investment of about €25 billion by commercial State Owned Enterprises. One key aspect for future planning for some TDs is the inclusion of a ‘Rural Regeneration and Development Fund’ which Minister for Rural and Community Development Michael Ring is understood to have negotiated with Finance and Expenditure Minister Paschal Donohoe over numerous meetings. While details are still being withheld until the planning framework publication, it is understood the fund will allow for investment in infrastructure projects and schemes for rural towns. Many rural TDs argue that the NPF leaves rural Ireland behind and is too “Dublin-centric”. Despite stating on the airwaves earlier today that he had concerns about an initial draft plan, Minister Ring told reporters a short time ago that he is now “very happy” with the current plan as it stands. He acknowledged that “it can’t be one for everyone in the audience”. Ring added the plan will improve the lives of those in rural Ireland. “The whole country will be looked after. I am quite happy now that what is in the plan will help the north-west, the west and other parts of the country as well,” he told reporters a short time ago. Following tonight’s meeting, Ministers Paschal Donohoe and Eoghan Murphy said the new capital plan will set out a 10 year vision for the development of public capital infrastructure. “The National Planning Framework and 10 year Capital Plan will be published, together, in the coming weeks, which will be first time that an Irish Government has prepared joined-up, evidence based planning and investment strategies to transform our country into the place we want it to be over the next 20+ years,” said Donohoe. The proposed projects will create new opportunities for community led regeneration across the country, said the ministers, who added that the long-terms plans are an opportunity “to create and share a vision for our country”. Email “Here are just some of the project promises the government plan to deliver in the next 10 years”. Feedback on “Here are just some of the project promises the government plan to deliver in the next 10 years”.